Notes: This television series is part of a mixed-media project; a manga by Yukito Kitajima and Yu Wazu began running in December 2013 (and is still running as of April 2014), while a role-playing game is set to be released in July 2014 as of this writing. "Hamatora" literally means "Beach Tiger"; the agency's mascot is a tiger. The "minimum" is a special inborn power found in a limited number of human beings, who are known as "minimum holders." In Yokohama, the detective team Hamatora, formed by two minimum holders named Nice and Murasaki, comes across information connected to a serial killer being pursued by their old friend Art. It turns out all the victims are minimum holders like them. Unwillingly at first, the two detectives become involved in the investigation. (Adapted from ANN). 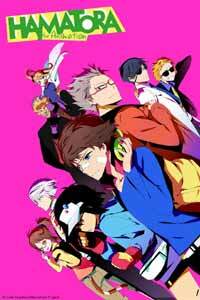 I'm glad that I was never on the hype train for Hamatora. I've gotten the impression that it was highly-anticipated in some circles, in part because of it being the newest series of Seiji Kishi, whose adaptation of Persona 4 gained a good deal of positive press some years back, but I've seen almost nothing but negativity since it began airing. I don't entirely blame the naysayers, ultimately, since Hamatora. has many flaws, among them a cast that never needed to be as large as it was and a story that has a hard time advancing beyond its roots as an apparent X-Men clone. And yet it isn't a series I regret watching, for its early self-contained episodes function as a good if pedestrian detective series, and it is certainly pretty to look at. It feels fair to say that more effort was put into its elaborate animation sequences than into its story, and I also suspect that it may function as one part of a story rather than a story itself given the existence of its tie-ins, but regardless, it was a fun enough watch to not be a total waste. I was certainly stunned by the visuals of Hamatora., but I can't say they significantly enhanced my understanding of the story. One could argue that the palette and character design have an overload of colors, but this wasn't something I minded; the character design in particular, while not something I'd cite as a favorite, is certainly cool to look at. The level of detail in the clothing and accessories is admirable (though the facial features are plainer), and the color variation is different from what I'm used to in today's anime, for this series uses bright tones selectively to draw attention instead of drowning the entire show in them. The battle scenes, meanwhile, are perhaps both the show's most notable and most disappointing quality, for I appreciated the good animation and yet felt that the wash of colors employed to signify that the characters were using their "minima" was cold and sterile-looking rather than rich and psychedelic. Indeed, there was a disconnection I felt during these scenes that I don't want in such anime; the visuals and music in this series are strong in the former case and adequate in the latter, but they make a lot of noise without telling the viewer much else about the characters or story. As said, Hamatora. has far too many characters and too little time to deal with all of them properly. This isn't to say that I had a problem with the cast, for part of the reason I feel at all positive towards this show is that I came away feeling that I liked them, but at the same time I confess to feeling that I had no real idea as to who any of them were. We know that "Nice" (awkwardly-named, like most of the rest) is essentially a failed child prodigy now doing low-level jobs alongside other outcast Minimum Holders, the majority of whom find him irritating; he's easy to like, I found, but not easy to relate to. The characters are in part hard to distinguish based on the structure of the show, for it is primarily an action-based drama and quiet moments are largely reserved for comic relief or taken up by scenes of Hamatora's "landlord" berating them for their perpetual pennilessness. This is hardly the first case of a penniless agency being the center of an anime (Cowboy Bebop, anybody? ), and to be sure it functions decently as a premise, but I can't say this show really runs anywhere with it. Similarly, the "minimum holders" (another awkward term) are rarely differentiated clearly according to their abilities, and in truth it appeared to me that their supposed "powers" simply involved turning the sky strange colors during the fight scenes. The fight scenes mostly seem to consist of kicking and punching, really, with the "minima" nowhere in sight, and indeed, the villain's ability to assume another's form is just about the only power I remember clearly. The police detective Art, an ally of the agency, is somewhat more interesting in this regard in that he is the equivalent of Harry Potter's "squibs", a failed Minimum Holder who supports the agency through other means, but even he doesn't get the development that would have made this universe into something special. I was also somewhat dismayed to see that in general, the female characters have virtually nothing to do; they at least aren't purely the object of fanservice, but basically all of them are reduced to spouting one-liners. Indeed, "one-liner" also approximately describes the depth to which this series attempted to explain itself, and I really felt none the wiser about how this world worked at show's end. Hamatora is, in fact, almost better off when not pursuing its own mystery, for I enjoyed the standalone episodes in the beginning more on account of their having less overwrought drama and being devoid of the moralizing that creeps into the later episodes. In that regard, Hamatora attempts a story about discrimination that it isn't really smart enough to pull off, akin to the persistent anti-mutant undertones in X-Men and making yet another perhaps not-coincidental parallel with that series. The difference in quality between these later episodes and the early portions is not especially pronounced, but this show was certainly easier to have fun with when it wasn't being self-important. In short, I can't recommend Hamatora with much conviction: in my view, it's a clone of the X-Men comics done with prettier colors. Nonetheless, I don't truly feel much negativity towards it, and one could do far worse. In addition, perhaps the game and manga really will make it all worthwhile in the end, though I'm still not especially fond of series whose success is dependent on a tie-in. I must also note also that the ending of this season is abrupt even by anime standards, and while a second season has been confirmed, the two aforementioned factors are nonetheless a fairly big strike against the show. Recommended Audience: Blood flows freely in several episodes, and in one scene a character is blown up from the inside; the results are not especially graphic but it is disturbing nonetheless. One episode also consists of virtually nothing besides shirtless men and "boys' love" tropes, but fanservice is generally light otherwise. Not really a kids' show due to the pacing and themes, however.